A small group of very tough and long lived evergreen conifers with dense green or yellow-green foliage. A very valuable plant for winter structure. 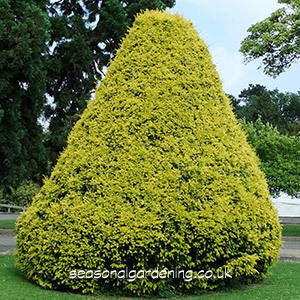 Yews are quite versatile and can be grown as a specimen tree or a clipped shrub. Drought and pollution tolerant, they are ideal plants for topiary and hedging. Foliage: Dense, dark green or green-yellow, needle-like, linear leaves. Evergreen. Flowers: Female plants have tiny flowers, followed by fleshy red fruits. Soil: Well-drained soil (chalk, clay, sand or loam). Acid, alkaline or neutral pH. Drought tolerant. Conditions: Full sun or partial shade. Can be grown in any aspect, in either an exposed or sheltered location. Habit: Erect bushes or multi-stemmed trees. Type: Shrub or small tree. Hardiness: Fully hardy in the UK (down to -20°C). Toxicity: Highly toxic if eaten. Do not eat any part of this plant, especially the seeds. Keep animals away. A favourite topiary plant that tolerates close clipping well. Good for garden boundaries or dividing a space into individual rooms. Its thick foliage makes the ideal backdrop for beds and borders. Yews can be planted in any good garden soil so long as it is not waterlogged. Plant out from autumn to spring. All the popular garden forms are very slow growing. Although only dwarf specimens are any good in containers. All types except the columnar forms make good hedges. Easy to grow and virtually indestructible, unless the soil is very wet or bone dry. To shape, prune hard in late spring. Hedges and shrubs be lightly trimmed all summer. Can also be pruned right back, even into old wood. If you want a tall tree, avoid pruning the leading shoots or plant growth will stall to a snails pace. Susceptible to attack by tortrix moth, vine weevil, gall mites and scale insects. Can be affected by phytophthora root diseases. Sow seed in trays in autumn and allow to germinate in a cold frame. Alternatively take semi-hardwood cuttings in summer. T. b. 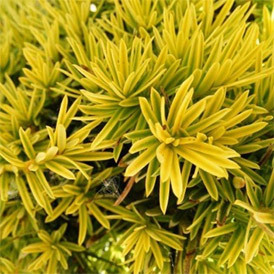 'Aurea' has yellow edged leaves and golden shoots. Height to 25ft (8m). T. b. 'Fastigiata' (Irish yew) is a more erect columnar form. Height to 25ft (8m). Available at Thompson & Morgan. T. b. 'Fastigiata Aurea' has rich golden-yellow foliage. Available at Gardening Express. T. b. 'Standishii' a narrow-columnar, slow-growing form, with brilliant golden foliage. T. b. 'Icicle' is a very slow growing form with yellow edged leaves that turn white in winter. Height to 3ft (1m). T. cuspidata (Japanese yew or spreading yew) is a species native to Japan and China. Mature height from 33ft to 60ft (10-18m). Compact golden forms are available such as 'Dwarf Bright Gold'. Height and spread to 6ft (2m). Available at Thompson & Morgan. T. x media (Anglojap yew) is a hybrid of Taxus baccata and Taxus cuspidata that forms a compact shrub or very small tree. Good forms include 'Hillii' a compact form with a columnar upright habit. Height to 6ft (1.8m). Available at Thompson & Morgan. Also 'Densiformis' which has a dwarf, spreading habit. Height to 3ft (1m). Available at Thompson & Morgan.